Mexican/Irish guitar duo, Rodrigo and Gabriela, brought down the house last night at Joe’s Pub with their unique blend of traditional mexican rhythms and thrash metal. Some highlights of the show included the great new tunes Tamacun and Diablo Rojo as well as covers of Wish You Were Here, Dave Brubeck’s Take Five and Metallica’s Orion and Enter Sandman. They capped off the show with a great version of Stairway to Heaven, which can also be found on the new album. 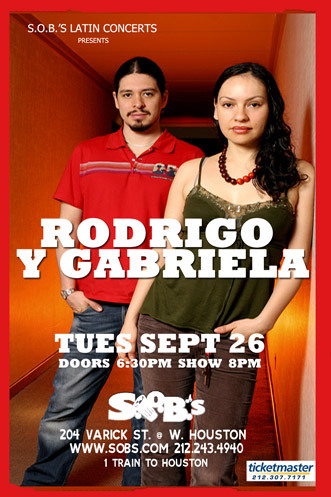 In case you missed it, Rodrigo told the crowd they are coming back in September for two nights (but the venue only shows one night on the schedule right now) at S.O.B.’s. Unfortunately, I gots no pics from the show.